First and foremost when using CCI & RCI we are going to start looking for divergences (Divergences are ways to find trend reversals or weakening of a trend) between the two. The fundamental problem with this is that typically these divergences are only seen on the larger time scales (4-HR, Daily, Weekly), and are harder to see from the noise on the 2-HR and below time scales. However, these smaller scales can still provide us with useful, and reliable information about when to enter and exit a trade, particularly, for those that are trading on margin whether it be a short position or a long position. We're going to start off on the daily view for XRP where I targeted entry for a rise in the value of XRP. Because my trade was based in the XRP/BTC we'll be using that chart. We can see on the daily a very clear divergence with the CCI bottoming out at -200 and bounce, along with the RSI hitting 30 and bouncing. From there the price continues it's descent with an ever increasing CCI & RSI over days. This provides us a perfect example of divergence leading to an upward move. What you will notice on the live charts is that CCI will start to swing up before RSI, or down before RSI. Therefore, CCI is our leading indicator giving us an idea of which way RSI is going to go over time as the lagging indicator. This is where planning exit strategies becomes important. Using the daily chart we can see that the price continued to rise even though CCI is descending. This is critical, as this happens nearly every single time that a peak is reached. Suddenly, the CCI will turn down, but the RSI continues to climb. If we mark our sell at the time the CCI value crosses below the RSI value that is the peak value for the run, and we know it is time to sell. As you can see, immediately following this cross is when XRP took a dip, and has not again reached that peak. Now, we have clues for our entry and exit on the daily, but what if we break it down to smaller time periods? Now we're going to break things down to the 4-HR chart to get a better idea of precisely when we want to make entry. Particularly, if we are margin trading then we want to try to get the absolute lowest price possible to take out our Long position or the highest price possible to take out our Short position. One of the keys to making a successful trade is a simple rule - never be on the vanguard. When an asset does it's initial pump following a long down trend it is almost always certainly doomed to retrace as there are many traders who have bought in above that price and are trying to dump on buyers to "Save," themselves from further losses. So, we want to wait for this to happen, fall back, and look for the divergence again. Using our CCI & RSI indicators we can see I made entry at the green vertical line which just happened to be when the RSI took a dip, but the CCI indicator continued upward. This let me know that the price bottom was there and that from this point forward there would be a slow move up culminating in a rapid price increase as pressure continued to build. A few days after we see the price explosion. You might think that because the CCI & RSI had a rapid peak to +600 and 90 that the party was over after the immediate fall back following it. This, however, is a pretty typical response to the initial wave from a sudden burst up. Best to hold on and let the FOMO buyers come in, as they will once they see the chart. 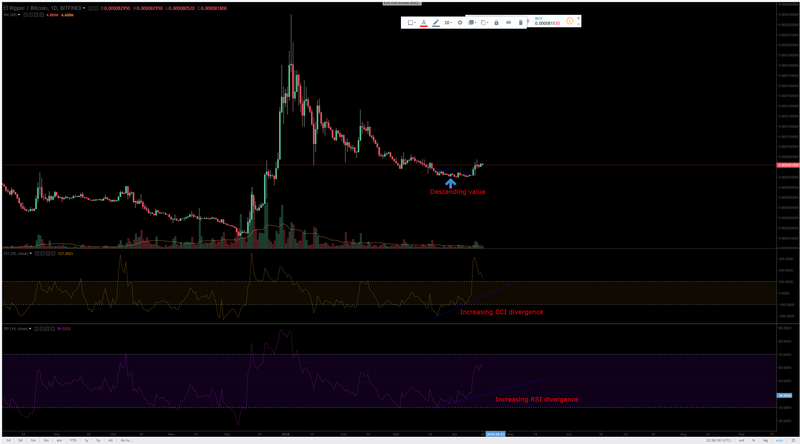 So, we see they do indeed come in, and in fact, that even with the dip XRP's value did not break the support lines of the CCI or RSI indicator. This let's us know that we are still in good shape. Remember what I said about the first pump? Don't let this pump and sudden fall back keep you from leaving profit on the table, as fast moves like this are often sling shots in both directions on the initial run. Now, where are we going to exit this trade once the price has moved up? Using the 4-HR chart below we can see that once the big move up actually occurs that RSI and CCI are moving nearly hand in hand. So, for our exit we are going to look for a divergence between the CCI & RSI indicators with CCI being the leading indicator and RSI being the following indicator. The yellow line on the CCI indicator shows us a bearish divergence against RSI. We can see the price is at a peak and the CCI has created two lower highs with the second low high being lower than the first and an RSI still above 70. 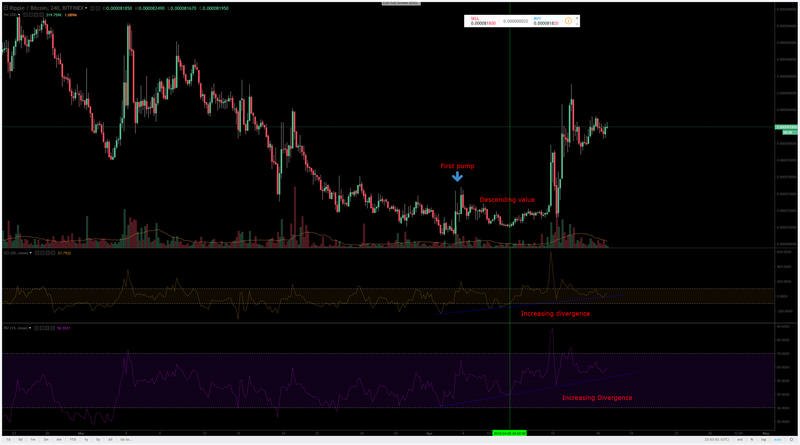 This is a good time to make your exit as RSI is going to float the price at the top momentarily. Shortly after seeing the second peak we can see RSI turn down, and subsequently a large move down by the bears as the bulls have exhausted themselves and loss the momentum. You can take this formula and apply it to the smaller time frames all the way down to five minutes. I often use this strategy when trading short term positions on margin for gains, as use of the 30-minute scale will normally allow me to hit peaks and bottoms for margin trades. Keep in mind that the smaller scales like the 30-minute and 15-minute MUST BE used in conjunction with the larger scales (2-HR, 4-HR, and Daily) in order to time your trades. Careful evaluation, and planning is needed to be a successful trader. I will elaborate more on the smaller time scalers later as time permits, but this lays a good ground work for the novice trader to start identifying shifts in the market to better time their trades for maximum profits.